RollBall is released by Fragment Multimedia and is available on the iPhone, iPod touch, and iPad for $0.99 and a Free alternative. Take a simple concept of bouncing a ball and add Tron-like graphics, sticky spinning disks, and high score records. RollBall has you tossing a ball up and around using disks to stick to and act as a jumping-off point to gain more height. This review covers the paid iPhone version of RollBall. RollBall is, as stated earlier, a simple game. You basically have one element of control and that’s tapping rotors. The ball will stick to the rotors and spin around. When you tap the rotor, the ball will fly off in the direction it’s pointing from the center of the rotor to the ball itself, in a semi-straight line. If your ball falls too far downwards, you will end up ending the level. There are red rotors that will destroy your ball on contact and timing is everything in RollBall. There are two game modes. Classic has a time constraint of 60 seconds where you climb as fast as possible while bouncing off the walls as many times as possible in a minute. Action gives you unlimited time to work your way up with more of a focus on timing and height. Classic mode gives you a feeling of racing and it gives you a bit of a challenge. I didn’t like Action mode as much since there was no real incentive to climb higher. The game’s main weakness comes from being a bit too simple. There are no major obstacles that appear later in a level, no rewards for hitting certain distances, nor is there any growth in playing the game. You tap the rotating disk things and bounce. 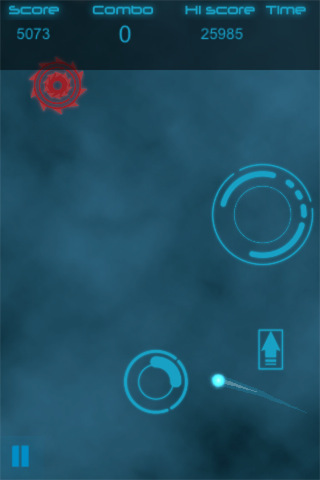 Sometimes you’ll collect powerups that barely changes a bit of the gameplay, but nothing spectacular or energetic. Graphically, RollBall has a clean design and art direction. Blue disks have soft rounded edges and Red disks have jutting, jagged spikes. If you fall too far, you’ll hit an electric barrior to represent the lowest point you can go. The interface and futuristic text look great as well so overall, the graphical presentation is the largest notable element of RollBall. I would like to see more from an app like this. Enemies that shoot bullets around while you try to bounce? Maybe you’re immune to fire while spinning on a rotor because it acts like a shield? Maybe some different rotors like one that explodes and sends you sky rocketing upwards with particle effects and a streak of light? Something to visually wow me while playing the game? The Photoshop cloud background has a dull and sleep inducing effect on me while playing. I would love to see maybe a Tron inspired city, a computer chip-like design, or maybe even some more cogs and balls bouncing around in the background. RollBall is far from bad and definitely deserves a try so they can get more feedback, therefore they can improve and turn this one into a super fine app. As it is, RollBall is a bit of a yawn with no major glitches or bugs. I did really like how clean the graphics are but that didn’t urge me to play the level again. Sample the free version of RollBall on your iPhone. AppSafari review of RollBall was written by Joseph Ho on March 29th, 2011 and categorized under App Store, Games, Physics Based, Time Management. Page viewed 3398 times, 1 so far today. Need help on using these apps? Please read the Help Page.